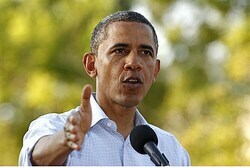 New poll finds that Obama out-polls Romney by 59 percent to 27 percent among Jewish voters. Economics, not Israel, matters to voters. Jewish voters still prefer President Barack Obama over Republican nominee Mitt Romney, according to a new poll released on Thursday by the Workmen’s Circle. The poll was conducted by a team led by Professor Steven M. Cohen. Among Jews, the Democratic President out-polls the Republican candidate by 59 percent to 27 percent, with 14 percent undecided. If the undecided voters split similarly, Obama would out-poll Romney by a 68 percent to 32 percent margin among Jewish voters. The issues driving the Jewish vote, according to the poll, are economic justice including regulating financial institutions, support for progressive taxation, and the argument that government should do more to help the needy. Senate Republicans: bill needs to say United States will use force to stop any nuclear weapons program. Senate Republicans blocked package of sanctions against Iran on Thursday because the bill’s wording was not tough enough in their opinion. The GOP senators said that besides listing economic sanctions, the bill needs to say that the United States is prepared to use force to stop any nuclear weapons program. “I just want to add one simple line that says we recognize what the president was saying that military force is also an option,” Sen. Lindsey Graham (R-S.C.) said on the floor during the debate over the bill. Republicans agreed that the bill as it is worded at present would signal a step back from Obama’s stated policy that he would do “anything necessary” to stop Iran from acquiring nuclear weapons capability. According to The Hill, Sen. Joe Lieberman (ID-Conn.), who has sponsored a separate use of force resolution with Graham and Sen. Bob Casey (D-Pa.), said the senators should be able to reach agreement sometime Thursday on necessary changes to the bill. Sen. Bob Menendez (D-N.J.) urged Republicans to pass the bill in its present form but agreed that the Senate should be on record as determining that Iran must not be allowed to obtain nuclear weapons. If it passes Thursday, the bill’s timing will send a message to Iran just days before next week’s talks in Baghdad between Iran and the five permanent U.N. Security Council members plus Germany. in September, but observers cautious on AJC poll results. Does President Barack Obama have his Jewish mojo back? Did the rightward tilt of the Republican presidential primaries, where culture war issues surged to the top of the GOP agenda, scare off potential Jewish voters? Or is Election Day simply too far in the future for a poll in April to carry much significance? Those are some of the questions to emerge as analysts dissect the data from the latest opinion poll of American Jews by the American Jewish Committee. The survey of 1,074 people who identify as Jewish, taken between March 14 and March 27, found that in the prior six months, the president — who has spent much of his term trying to beat back criticism from the Jewish right that he is anti-Israel — has seen his appeal to Jews spike to 61 percent, from 45 percent in September. And if the election were held today, former Massachusetts Gov. Mitt Romney, the presumptive GOP nominee, would receive just 28 percent of the Jewish vote. Prime Minister Benjamin Netanyahu is an “old friend,” Mitt Romney told folks at the American Israel Public Affairs Conference in Washington Tuesday. Rep. Howard Berman, the top Democrat on the Foreign Affairs Committee, edged in close enough at a Capitol press conference to be photographed with Netanyahu. And Sen. Mark Kirk, who recently suffered a stroke, put out a press release and video to mark Netanyahu’s wish that the Illinois Republican would recover quickly. Kirk isn’t Jewish, but a lot of folks in his old Chicago-area House district are. House Speaker John Boehner (R-Ohio) and Minority Leader Nancy Pelosi (D-Calif.) can’t agree on much, but they joined arms to embrace Netanyahu for a private lunch meeting with Berman and other lawmakers who have a hand in foreign policy. 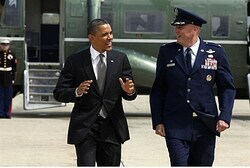 And both leaders sent out transcripts of their remarks at the joint press conference. 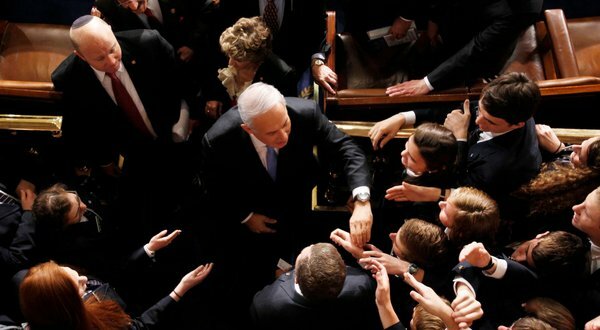 Netanyahu tried to return some of the congressional love during his press conference on Tuesday in the Capitol. While Washington, D.C. is increasingly consumed with bickering between Democrats and Republicans, the U.S.-Israel relationship remains the one issue that transcends the partisan divide. In a display of this bipartisan spirit, more than half of Congress will attend tonight’s Gala, along with representatives from 51 countries, administration officials, congressional candidates and other VIPs. Due to the extraordinary number of attendees, the Gala will take on a different format this year. All 13,000 Policy Conference delegates will fit in Halls D/E, where they will be treated to a pre-Gala concert featuring musical guests from the U.S. and Israel. Israeli Prime Minister Benjamin Netanyahu will deliver the keynote address. The prime minister’s speech will come a few hours after his meeting with President Obama. In addition, two longtime supporters of the U.S.-Israel relationship—Republican Senate Leader Mitch McConnell (R-KY) and Democratic Leader of the House Rep. Nancy Pelosi (D-CA)—will speak at the Gala. The Gala will be the end of a full day of Monday programming. The morning kicks off with an address by Sen. Joe Lieberman (I-CT), chair of the Senate Homeland Security and Governmental Affairs Committee. After the morning plenary, delegates will head to panel discussions on topics affecting the U.S., Israel and the Middle East, as well as lobbying workshops, where they will learn from AIPAC’s top experts how to make the case for Israel on Capitol Hill tomorrow. Meeting of Prime Minister Benjamin Netanyahu with Republican Congressmen delegation headed by Eric Cantor in Jerusalem. Prime Minister Benjamin Netanyahu today (Monday), 22.8.11, in Jerusalem, met with a delegation of 25 Republican members of the US House of Representatives, led by Majority Leader Eric Cantor and Policy Committee Chairman Tom Price. Prime Minister Netanyahu thanked the US and the Congress for their strong support of Israel. He noted the successes of the Iron Dome system in intercepting missiles and added that he intends to station additional batteries in order to defend Israeli cities. ראש הממשלה בנימין נתניהו נפגש היום בירושלים עם משלחת של 25 חברי קונגרס אמריקאים מהמפלגה הרפובליקנית. בראש המשלחת עומדים מנהיג הרוב בקונגרס, ח”ק אריק קנטור וראש הוועדה הרפובליקנית למדיניות, ח”ק טום פרייס. ראש הממשלה הדגיש בדבריו את הקשר הישיר בין המחבלים בעזה ובין המשטר האיראני ואמר: “אלו שיורים טילים על ישראל נתמכים ע”י איראן בנשק, בכסף ובאימונים”. עוד הוסיף כי “הם מהווים שלוחה קדמית של איראן על גבולותינו. כפי שאיראן מאיימת עלינו כך היא מאיימת על ארה”ב”. ראש הממשלה הודה לארה”ב ולקונגרס על תמיכתם האיתנה בישראל. נתניהו ציין את הצלחותיה של מערכת “כיפת ברזל” ביירוט טילים ואת כוונתו להציב סוללות נוספות להגן על ערי ישראל. Eighty-one congressmen, or about 20 percent of the US House of Representatives, will visit Israel over the next three weeks during Congress’s summer recess, with the first group of 26 Democrats scheduled to arrive on Monday. The Democratic delegation will be followed by two Republican ones, bringing a total of 55 Republicans. Most of the representatives are freshmen congressmen, with 47 – or fully half of the freshmen Republicans voted into office in 2010 – making the trip. For many of them, this will be their first trip to Israel. The week-long trips are sponsored by the American Israel Education Foundation, a charitable organization affiliated with the American Israel Public Affairs Committee, which brings large delegations of congressmen here every other August. House Democratic Whip Steny Hoyer (D-Maryland) will head the Democratic delegation, and House Majority Leader Eric Cantor (R-Virginia) will lead one of the Republican groups. Hoyer, in a statement, said he looked forward to “returning to Israel to continue learning firsthand about the evolving security situation in the Middle East, the deep challenges facing Israel, and the role the US can play in the region during this time of uncertainty. The delegation will visit both Israel and the West Bank, and is scheduled to meet with President Shimon Peres and Prime Minister Binyamin Netanyahu in Jerusalem, and Palestinian Authority President Mahmoud Abbas in Ramallah. Among those on the delegation arriving Monday are Illinois Congressman Jesse Jackson Jr., Ohio’s Betty Sutton, and Pennsylvania’s Mark Critz. In a related development, The Israel Project will be bringing a group of 18 Washington-based ambassadors from Asia, Europe, Africa and Latin America to Israel on Monday for a weeklong tour and high-level meetings. Like the congressmen, they will also go to Ramallah, for a meeting with PA Prime Minister Salam Fayyad. Among the countries represented on the trip are Albania, Barbados, Belize, Burkina Faso, the Dominican Republic, Haiti, Macedonia, St. Lucia and Uganda. Some of these countries have been mentioned by officials in Jerusalem as likely candidates to either vote against, or at least abstain, when the vote on Palestinian statehood comes before the UN in September.